My good friend, Pat, and new friend, Sonya, and I did a one-day rendez-vous at the Atlanta Sewing and Quilt Expo this weekend. The temptation at Laura Murray's booth of hand-dyed kimono and paint stick creations was too tempting for Pat and I to pass up. Here's my souvenir from the show. The fabrics are over-dyed kimono silk panels and the two buttons were in the sale basket. A lovely combo: hand-dyed silk, buttons and sale. 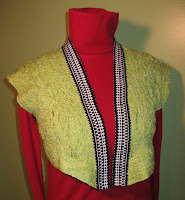 I'm teaching my Yarn Fabrication Wearable Art Vest workshop this coming Saturday, March 19 at Chattanooga Sewing. With my recent purchase, I'm inspired to combine the yarn technique with the silk panels—somehow. I'll have to let this concept germinate... Ideas?? There are still a few open spaces in the class, so come and join in the creativity! Call (423) 899-3664 to register. I'm so sorry I missed the Sewing Expo this year, but I'm glad you bought something from Laura Murray to make up for me. I love her booth - all the silks and patterns and Paintstiks and whatever else she has. Make it up into something beautiful!